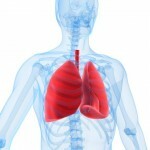 It is possible to have a partial or complete lung collapse. Sometimes a partial collapse might affect just a small part of the lung, and you may only have mild symptoms, or may even feel nothing. A very small lung collapse may heal on its own, but it is very important to see a doctor if you think you have a collapsed lung. Bluish skin colour due to lack of oxygen. Some BHD patients find that instead of a sharp stabbing pain, they get an ache, a feeling of pressure, or a crackling sensation in their chest or throat, and that symptoms get worse when lying down. Some patients also report feeling as if their lung is moving around in their rib cage when they lean over or stand up. Surprisingly, symptoms sometimes disappear when lungs collapse further, so you should seek treatment even if your symptoms seem to have passed. If you have these symptoms, it is important you get medical attention as soon as possible, preferably from an Emergency Department at a hospital. Here, the doctors will be able to see if your lung has collapsed and will be able to give you appropriate treatment. We recommend talking to your usual doctor in advance about what you should do if you think you are having a pneumothorax, so you are prepared to act appropriately.